The Wheel of Fortune lets you see that emotionally – your strongest feelings are where you will find your talents. Spiritually – to seek your fortune is to grow. Mentally you must “risk” misfortune to grow and physically you are rewarded as your talents manifest themselves. Look for new opportunities – change is exactly what you need. Examine new ideas carefully before you discard them. Exercise your strength and prepare to adapt to new and different circumstances. Treat everything as an opportunity. Do it with an optimistic mind, fearless heart and sense of service to the planet and this good karma brings success and rewards to all levels of life. Innovative ideas will result from your past experiences – decisions will be made, luck prevails and destiny will work itself out positively, for you are growing toward wholeness and harmony. First you get an idea, then you get fired up about doing it – you choose a suitable means to achieve it, you are required to go through the “blood, sweat and tears” of the process and finally – you see the results. Maintain a steady pace – things are not always as they “seem” on the surface. Keep planting the seeds you wish to reap – they will develop in time. As your inner, mental images exteriorize – new situations and experiences must fit your existing “belief” structure. New ideas cause change and you can change or alter your experiences by changing and altering your beliefs. To prevent a “limiting” belief from creating reality – you must first become aware of it, so that you can change it according to the reality you want. To change a physical effect – you must change your original belief and as your beliefs change so will your experiences. Reality is relative to the point of view of the viewers choices. “Fate” represents the destiny God has chosen for you – based on reasoning which only He understands. Fate is also an illusion – for with your limited vision, you can not see the “inner” connection between all things. You receive a vision of the inner meaning of life – which at the end will become real – embodied in your own being. 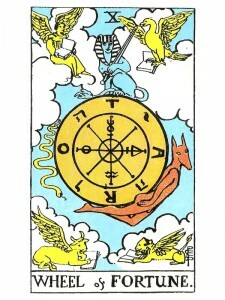 The Wheel represents the laws of Karma – the simple explanation of “fate”. The actions you take in this life, build up a certain destiny for you in the next and if you create a great many “negative” situations in one lifetime, you will create the “psychic” need for punishment, so you will choose a lesser or diseased body in your next reincarnation. It is only your limited understanding that prevents you from directly experiencing the truth behind this “fate” or karma. Enlightenment is remembering – gaining the full knowledge to perceive that your life is only a “form” created by your desires. Release your desires and you are released from the Wheel. The pattern of your life can not become visible until you step away from it. Withdraw to see the whole pattern of where your life has gone and where it is going. Though your body dies – your soul continues. If you wish to release your true self, you will need to free your soul from your “ego” habits, fears and defenses. Facing your “imagined” terrors of the darkness will lead you into the light of truth. The Wheel signifies change in the circumstances of your life and change requires reaction. Accept new situations – adapt quickly to them and seek their true meaning and value. Pierce through the mystery of the event to find a greater understand of life. For instance – the realization that the end of a love affair – despite its pain, has led to a greater self – knowledge. Discovery of true faith/trust in God and in self – acceptance. The mind begins to know the spiritual as the mind and heart cooperate and you begin to “pay attention”. You begin to realize that you must give equal time to your internal environment and its sensory input as well as the external environment and input from the five senses. A new level of energy and inspiration – a voluntary change. A submission of self to higher authority – turning from a limited, self – serving life to an expanded self – directed to serving others. You only reach this point after you have served yourself well and are as strong and capable as you are willing. The will to take a chance, to spin the Wheel – you now realize there is such a thing as chance. God does not play dice with the universe. Faith is not “suspense of doubt”, it is the quest itself. The wheel represents the ups and downs even in faith. The healthy act of “letting go” is actually an assertion of our will. A balance of give and take at the spiritual level, alternating the flow between that of man and of God. The God in man speaks to the man in God. What life – changes are you experiencing? How are you adapting to these changes? What effects are you feeling from circumstances you put in motion previously? Is there something you need to resolve? How are your horizons expanding? In the first position: Here you are at the main gate and a magnificent gatekeeper you make indeed. For entrance into this outer courtyard requires the passing of the word by gatekeeper and traveler alike. This is a life based on the true understanding of faith as the key to the word and therefore its passing. In the second position: The Physical/material Plane has been structured to accommodate spirituality in the routine of everyday life. Whether overt or subtle, there is ritual observance of your beliefs as you facilitate communication with God through your Spiritual Plane. You may spend most of your time and even make your living in these pursuits. In the third position: Exercise your vote, stretch the muscles of your free will, for the will of God is favorably disposed. These two aspects of divine will are aligned. Ask and you will receive. But think carefully of all the ramifications of your request. Remember King Midas. In the fourth position: Here was an early understanding of the nature of faith and therefore of the duality of will. And so, this young heart was able to dedicate itself to God at a tender age, innocent yet experienced and mature beyond its years. In the fifth position: The mind is focused on God. A state of prayer, invocation, intercession for self or others. Voting your will. A conscious attempt to merge self – will with the will of God. In the sixth position: What do you do when the wheel lands on GO? Here you are becoming a devotee, discovering the full meaning of love. This is falling in love with love, where there is recognition of God in self and self in God and life starts to really take on meaning. In the seventh position: Test of faith in the near future. A chance to encounter the ineffable and make some sense out of it afterwards. In the eighth position: Here is faith infused action. Courageous behavior, leaps of faith. The ability to move when your exact destination is unknown, to jump when it is impossible to see the other side. In the ninth position: The heart is focused on God. A state of meditation. Acceptance of grace. In the tenth position: One overhears as the gods speak to the gods. There is an ineffable presence. I adore your interpretations, and this one of the Wheel of Fortune is among your very best: it is filled with spiritual truth and deep understanding of the relationship between the soul and God. I can’t thank you enough for the inspiration and clarity you give me on a daily basis. Hare Krsna!